Is this a Mac discussion? The Mac helper app features include a screen capture instead of a web page capture. The Mac data is updated directly, then sync'd to the web; the WC updates the web, then syncs to the Mac. Evernote for Mac and Windows both come installed with a companion app called Evernote Helper which can be found by clicking the Evernote icon in your menu bar (Mac) or right-clicking the Evernote icon in your system tray (Windows). Evernote Helper lets you create quick notes whether or not Evernote is open and running on your computer. When I right-click the Evernote icon in the Windows system tray, there is no Evernote Helper in the resultant popup menu. However, there are functions listed on that menu that correspond to what the article says that Evernote Helper will do. 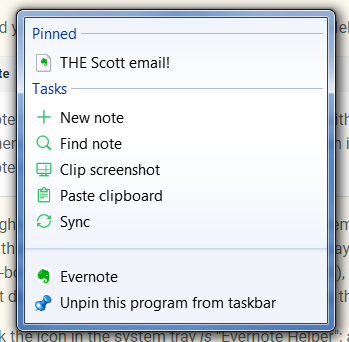 Even when the Evernote program interface is closed (by clicking the red X-box at top right of the window, not by File > Exit), the Evernote icon (now a nearly invisible white elephant outline) is in the system tray, and right-clicking it does give access to those functions, including the Web Clipper ("Clip Screenshot" in the menu). So: I think the icon in the system tray is "Evernote Helper"; and I think it is simply another way to start the Web Clipper (among other things), not a separate program with extra functionalities. Thanks for raising this, @bobzani. I wasn't aware of the terminology "Evernote Helper," and I'm not sure whether it is more helpful (heh) or confusing. But now I know it exists. I had never heard it called that either, but I searched "Helper" and found - https://help.evernote.com/hc/en-us/articles/209005067 - huh, go figure.